Lyra Research has released of a series of reports that cover the wide-format printing market. The three new wide-format market reports are based on key findings from Lyra’s Wide-Format Printing Industry Advisory Service 2009 forecast. Included in the series are the following three reports: A Tumultuous Period for CAD Hardware and Supplies Markets: Worldwide Forecast, 2006–2013; Worldwide Forecast for the Wide-Format Solvent Market, 2006–2013; and Worldwide Forecast for Aqueous Graphics Hardware and Supplies, 2006–2013. Lyra Research, the digital imaging authority (http://www.lyra.com), has released of a series of reports that cover the wide-format printing market. The three new wide-format market reports are based on key findings from Lyra’s Wide-Format Printing Industry Advisory Service (WFS) 2009 forecast. Included in the series are the following three reports: A Tumultuous Period for CAD Hardware and Supplies Markets: Worldwide Forecast, 2006–2013; Worldwide Forecast for the Wide-Format Solvent Market, 2006–2013; and Worldwide Forecast for Aqueous Graphics Hardware and Supplies, 2006–2013. A Tumultuous Period for CAD Hardware and Supplies Markets: Worldwide Forecast, 2006–2013 examines why the market for wide-format CAD ink jet hardware and supplies experienced a steep decline in 2008 and 2009, and why it is expected to decline further as a result of the recession. Macroeconomic and industry-specific problems such as the global downturn in the architectural, engineering, and construction (AEC) sector and the lengthening of the printer life cycle are battering OEMs and end users alike. As a result, Lyra’s 2009 WFS forecast reflects a level of decline that is without precedent in the industry and projects that hard times will impact the industry for the next few years. Specifically, this report analyzes hardware, ink, and media in the 24- to 44-inch (61 to 112 cm) wide-format CAD ink jet printer segment. For more information on A Tumultuous Period for CAD Hardware and Supplies Markets: Worldwide Forecast, 2006–2013, please visit http://lyra.ecnext.com/coms2/summary_0290-1039_ITM. Worldwide Forecast for the Wide-Format Solvent Market, 2006–2013 analyzes and provides forecast information for the solvent market. It explains that solvent manufacturers face long-term challenges in addition to the effects of the brutal, short-term recession, and it provides a comprehensive outlook for solvent printer, ink, and media shipments and revenue. Specifically, the report covers six wide-format solvent market segments: high-end (elsewhere), high-end (China/South Korea), midrange (elsewhere), midrange (China/South Korea), low-end (1+ meter), and low-end (less than 1 meter). Details are also provided regarding the maturity of the market, the need for new hardware platforms, the impact of alternative ink jet technologies on the industry, and the influence of environmental regulation. 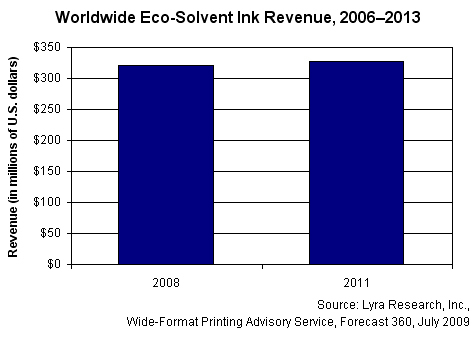 For more information on Worldwide Forecast for the Wide-Format Solvent Market, 2006–2013 report, please visit http://lyra.ecnext.com/coms2/summary_0290-1041_ITM. Worldwide Forecast for Aqueous Graphics Hardware and Supplies, 2006–2013 discusses how the recession has caused aqueous graphics vendors, ink manufacturers, and media suppliers to search for ways to stabilize their businesses over the last 12 months and position their companies for long-term growth. This report covers aqueous graphics hardware (24- to 44-inch and 44+ inch wide-format graphics printers); competition that the market is encountering from solvent, UV-curable, and latex devices; the consolidation of aqueous production; shipment and revenue figures for ink and media; and the hardware installed base. For more information on Worldwide Forecast for Aqueous Graphics Hardware and Supplies, 2006–2013, please visit http://lyra.ecnext.com/coms2/summary_0290-1040_ITM. “These forecast reports provide keen insight into the economy’s impact on the market; hardware, ink, and media shipments and revenue figures; the demand for new technology; and the competitive and regulatory forces that are shaping the market’s future,” commented Andrew Lippman, senior analyst for Lyra’s Wide-Format Printing Advisory Service. The three wide-format market reports—A Tumultuous Period for CAD Hardware and Supplies Markets: Worldwide Forecast, 2006–2013; Worldwide Forecast for the Wide-Format Solvent Market, 2006–2013; and Worldwide Forecast for Aqueous Graphics Hardware and Supplies, 2006–2013—can be immediately purchased for $950 per report. All three of the reports can be purchased for $2,500. For more information about report purchasing options, please contact Sandy Tobin, client relations manager, at 617-454-2612 or stobin(at)lyra(dot)com, or visit Lyra’s online store at http://lyra.ecnext.com/coms2/page_browse. In addition to these three reports, Lyra’s Wide-Format Printer Advisory Service will soon release two more market reports: Wide-Format LED Hardware, Toner, and Media: Outlook and Worldwide Forecast, 2006–2013 and Wide-Format UV-Curable Hardware and Ink: Outlook and Worldwide Forecast, 2006–2013. Both of the new reports will be available for purchase at http://lyra.ecnext.com/coms2/page_browse. Sign up now for Lyra’s Hard Copy, Marking Supplies, Media Supplies, Consumer Imaging, Europe, and China Research Briefs, which feature forecast information and primary research data. The research briefs are delivered via e-mail approximately every quarter. Special bulletins also are distributed that contain information regarding Webcasts and events related to each of the topics in the briefs. To update your profile and add your name to the mailing list, click here http://visitor.constantcontact.com/d.jsp?m=1101693414919&p=oi and enter your e-mail address. Instructions that explain how to join the appropriate list will be e-mailed to you. Supported by an experienced team of analysts and researchers, Lyra’s Wide-Format Printing Advisory Service (WFS) tracks and quantifies the burgeoning wide-format UV-curable printer market and the changing dynamics of the wide-format aqueous and solvent printer markets. Lyra recently enhanced the WFS by including added coverage of the aqueous printer markets and a new database of product specifications. The database provides product specifications for every wide-format aqueous, solvent, and UV-curable printer that is currently in the market. The service also includes a regionally segmented annual forecast for aqueous, solvent, and flatbed UV-curable hardware, ink, and media; forecast perspective reports; primary market research studies; and analyst inquiry. Lyra Research collaborates with imaging industry decision makers worldwide, enabling clients to strengthen their market position and achieve profitable growth. Lyra’s expert analysts and editors help clients devise and implement creative solutions to business challenges, arming them with competitive intelligence, strategic and tactical advice, news and analysis, and market forecasts.